After our recent visit to Paris, Knights of the Vine Russia (KOVR) Commandeur Suprême John Ortega suggested we try French wines for our next wine tasting and then asked, “what about a fi rst growth tasting – what are the fi ve chateaux?” And then he named them, and within a day he called me from the wine shop to say he had purchased one bottle from each. What better way to celebrate the four years of Passport wine reviews but with what should have been some of the best wines from Moscow’s overpriced shelves? The first record of vineyards in Bordeaux dates back to 71 AD, though they were probably planted a few years earlier to provide wine for Roman soldiers. By the middle of the nineteenth century wine had become an important industry for France so Napoleon III asked for a system of classification for Bordeaux wines for the 1855 Exposition Universelle de Paris. Wines were ranked from first- to fifth-growth and only four chateaux made first growth, (though Château Mouton-Rothschild was raised from second to first in 1973). Within a few years of the classification, from 1875 to 1892, virtually all of Bordeaux vineyards were destroyed by Phylloxera, a root-feeding pest. Fortunately the vineyards were restored with native vines grafted onto Phylloxera-resistant American rootstock. Bordeaux continues to be the best known of the world’s wine regions, and it is now the world’s second largest. Visit a Moscow wine shop and it looks like Bordeaux wines represent ten percent or more of the wines on the shelves. Russian appreciation of French culture and wine dates back to Peter the Great’s trip to Paris in 1717 so when imported wines started to appear in Moscow shops in the 1990s, Bordeaux became the leader. Only recently have New World wines begun to take away market share. Bordeaux red wines, also called claret, are primarily blends of Merlot, Cabernet Sauvignon and Cabernet Franc, the ratio depending upon the terroir of the vineyards in one of the region’s fifty-seven appellations (geographical areas with restrictive rules on types of grapes, alcohol level, and maximum grape yield). Ninety percent of Bordeaux wines are red; the whites are mostly made from Sauvignon Blanc grapes. Bordeaux labels can be complicated to decipher. A basic Bordeaux wine made from grapes from anywhere in the region is simply labeled Red Bordeaux. A somewhat more restrictive label, Bordeaux Supérieur, should be of better quality. Wines that carry the name of particular areas or villages such as Graves, Médoc or Saint-Emilion have tighter production and quality requirements. This should have been a dream wine tasting, a once-in-a-lifetime treat for most wine lovers, but we were to learn some hard lessons about the Russian wine market. The lineup for the night had Wine Spectator and Robert Parker scores of no less than 90 and an average of just over 93. The total bill after a discount came to just over 120,000 rubles or an average of $600 per bottle. Hot chocolate fritters with passion fruit sorbet. We arrived early to make sure the wines were decanted and had time to settle and breath before serving. 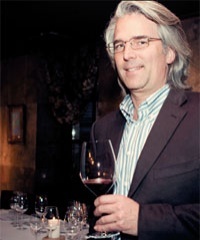 KOVR Scott Perrelli, a professional wine buyer, inspected the setup including the glasses to ensure that they were appropriate to the wine. While we waited to start we refreshed ourselves with a 1991 red Dominus (Napanook Vineyard), a Napa Valley Cabernet Sauvignon, and a white Gaja Gaia & Rey, a highly rated Italian Chardonnay. Both of these wines are highly rated and were excellent. The room was quiet. The Carre Blanc sommelier carefully poured each of us a glass of the first wine, a 1999 Château Margaux, and we were well aware that each 75ml serving had an average cost of about $60. By the time we tried the second wine, some concern had arisen. The wines were not corked – ruined by a bad cork – they were flat and lacked any distinction. The glowing adjectives of the Parker and Wine Spectator reviews, “tight and silky red, captivating aromas of currant, black licorice and spices, almost exotic fruit character on the finish,” or “seductive juice, gorgeous aromas of crushed berries” were just not applicable. By the time we finished all five, the Knights were one disappointed group. We consoled ourselves over a bottle of Hahn Cabernet Sauvignon (South Africa) off the Carre Blanc wine list that would have scored better with the KOVR than the first growths. These Bordeaux were not too young or past their prime – based upon the reviews they should have been just right. We dismissed the idea that they might have been counterfeit, and finally concluded that transport and storage had to be the problem. Wine is a delicate substance, and some wines are known not to travel well. Wine should be transported between 13 and 18 degrees centigrade and the temperature should not fluctuate more than a few degrees. Humidity during transport should range from 50% to 80% and storage should be at about 70%. Excessive shaking and vibration should also be avoided. These poor high-strung first growth Bordeaux appear to have been sorely mistreated. Since most of our readers probably will not, and probably should not (given the results of our tasting) buy a first-growth Bordeaux in Moscow, in a future issue we will provide a short list of the best-rated Bordeaux to assist with selection from the hundreds on the shelves.